The AAFF is a free event. All welcome (but some films rated age 15+). Early registrations closed midnight on Wednesday 2 November. Congratulations to the five SBS competition winners of double passes to MOTHER FISH, our closing film. You will receive an email and can collect your tickets at the registration desk. Those who have already registered early for both days or Sunday have a reserved seat at MOTHER FISH and will also go in the draw to win some great prizes. See our special offers page. Forget to register? MOTHER FISH is now fully booked. All other sessions have a very limited number of seats left available. Thanks for your interest and support! We hope to see you at future events. 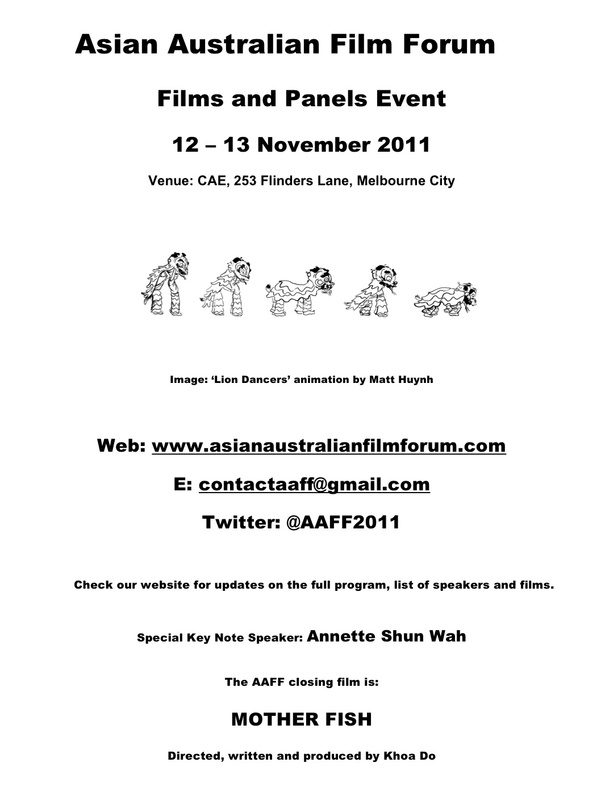 To further information on how to get updates please email: contactaaff@gmail.com and don’t forget to look out for a special PERIL MAG edition developed with the AAFF on Asian Australian Films in early 2012. Posted on 22/09/2011, in Uncategorized. Bookmark the permalink. 2 Comments. Thanks for your interest Dino. Will send you info on how to attend via email.